Recommended for: Beer fans and comic fans, especially those who are both. This book is a decently thorough, yet concise, book on beer, not only its history, but on the science behind the brewing process. 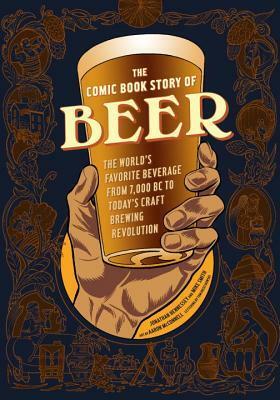 Hennessey, who has written other graphic "novels" on history, and brewer Mike Smith, sift through a lot of history and come up with some new ideas. Like the fact that we can only date the history of beer back to 7000 BC because that's when people started making it in pottery that can be found today; animal skins or wooden vessels from earlier times would have decayed away. The authors delve a bit further, too, into other aspects of beer history that are just touched on elsewhere: the fact that Rome and the Greeks were responsible for denigrating this universal brew only because THEY had wine grapes (and once Christian Rome fell to those beer-swilling barbarians, it was up to the far flung, beer brewing Irish monasteries to keep civilization going); the centuries-long role of women as primary brewers (and the first "public houses" were likely the homes where the lady of the house was good at her craft). I could summarize more "I never thought of that" bits, but let's move on. Sprinkled through the book are one-page infographics of historic beer styles, like bock, Trappist dubbel, porter, IPA, American lager, American pale ale, and Pierre Celis' resurrected Belgian wit. These summaries do mention the current scholarship questioning the accepted origins for porter and IPA, the usual "A-Ha!" traps beer geeks like to find. The book concludes with a section on the resurgence in craft brewing and an appreciation of the worldwide, American-led, craft brewing renaissance. Like a good beer, it's filling yet easy to take, and keeps you coming back for more. Sign into Goodreads to see if any of your friends have read The Comic Book Story of Beer.